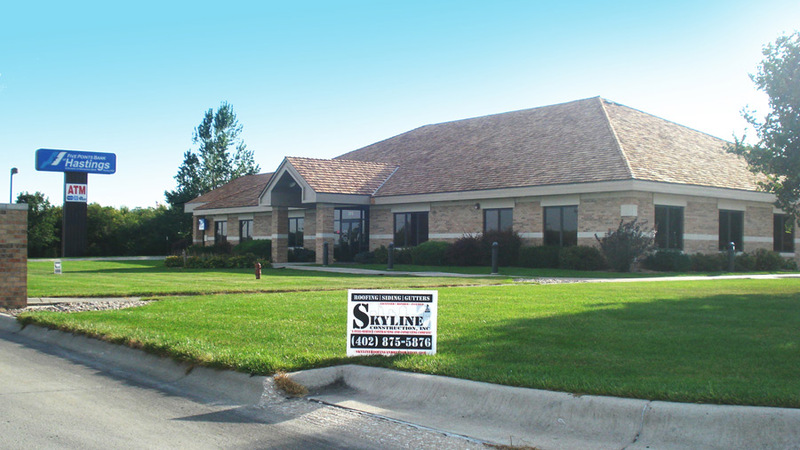 Slate is over 300 million years old, and a good slate roof will last your building over 130 years. Slate has an unique characteristic known as ‘cleavage’, which means that it will always split in the same plane, this is why slate has been used as a roofing material for many centuries. The art of slate roofing involves the laying of individual pieces of slate on the line of the roof pitch. It is an ancient craft. A new slate roof is a big investment. Whether you are reslating an addition, or installing slate on your custom home, you want your new slate roof to last its intended life span. 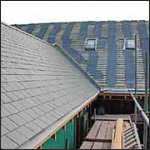 There is only one way to install a slate roof – the correct way. Installing slate correctly only comes from experience. Experienced slate roofers know how to drive the nail in to hold the slate, what type of nail to use, and how to lay out the roof and starter coarse. The fasteners holding the slate on the roof have to be set correctly, not driven too loosely and not driven too tightly. The slate should just hang on the nail, with the head of the nail driven just into the recess of the pre punched nail hole. If the nail is driven too tightly, the slate wont hang loosely, and will break with the change of temperature, load, and other forces acting on the roof. Each slate must move independently of every other slate on the roof. If the nail is driven too loosely, the nail head will break the slate above it. Using the wrong fastener is detrimental to a new slate roof. Many inexperienced slaters are quick to reach for the wrong nail when applying slate. A large head copper slating nail should be used in the correct length to match the thickness of the slate. A non-corrosive metal is a must. Copper should be used at all times, especially on low sloped roofs where water tends to shed slowly. I have seen a few roofs both repaired with the wrong fastener and installed with the wrong fastener. Corrosive fasteners disintegrate to the point where virtually nothing holds the slate in place – and the slate fall out! Finally, among the most frequent problems encountered with new slate installation are inadequate side and headlap and the failure to install lathe strips under the starter equal to the thickness of the slate. Slate is sold by the square. One square equals one hundred square feet of coverage using a 3" headlap. Shortening the headlap or trying to “stretch” the slate out over the roof using less than a 3" headlap is an unacceptable practice sometimes used to cover more square footage with fewer slate.